For over 19 years, Wesleyan Academe at Plymouth Park United Methodist Church has guided young minds in a Christ-centered education. During the 1970s, Plymouth Park Methodist Preschool and Kindergarten was first established to instruct the young preschool student. Renamed Wesleyan Academe in 1993, a new expanded education wing was constructed to accommodate our growing student body. Now after 50 years serving Irving and the surrounding Metroplex, we have grown again! We expanded our schoolrooms to offer more classes for ages 2 years to First Grade. Named after the most well known and beloved ministers of the early Methodist Church, John Wesley’s example of Christian education created enthusiasm for learning and moral behavior. Our Wesleyan Academe teachers and staff yearn to teach, and your child will be welcomed with joy. We admit all children, regardless of race, creed or religious background. We strive to continue to lead the way in Christian education. Our doors are open! We invite you and your child to come in and meet with us! Day Care / Child Care – Before and after care for children ages 2 years to First Grade. Preschool – Half or full day preschool for children ages 2 years to 4 years old. 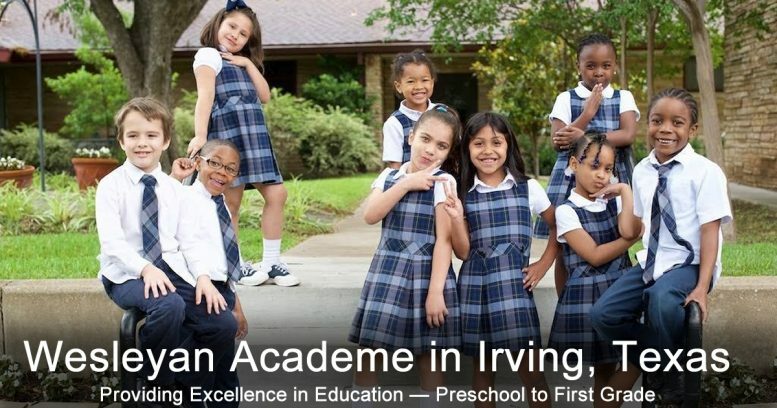 Kindergarten – Private Pre-K and Kindergarten full day program. First Grade – Private First Grade program.